171. Subacute combined degeneration (SCD). 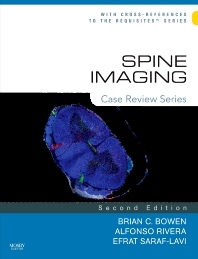 This volume in the best-selling "Case Review" series uses nearly 200 case studies to challenge your knowledge on a full range of topics in spine imaging. Each case includes a set of 1 to 4 unknown images and four self-test questions, accompanied by answers, supporting literature references, and a commentary to help you gain a better understanding of how the correct diagnosis was reached. The discussion addresses the most important imaging, pathological, and clinical features of the case. This unique case-based format - coupled with an easy-access organization and high-quality images - equips you with the guidance you need to master the material, pass certification exams, and succeed in practice. Serves as a useful preparation tool for certification review with its unique case-based format that mimics the actual exam. Illustrates many nondegenerative diseases of the spine, such as congenital, vascular, neoplastic, inflammatory/infectious, and traumatic cases, including abnormal imaging findings. Covers diseases involving spinal nerves and paraspinal plexuses, facilitating recognition of entities such as hereditary peripheral neuropathies and the perineural spread of neoplastic disease. Offers more than 400 high-quality, state-of-the-art images - most new to this edition - representing a wide range of clinical situations encountered in the field. Features cases at three different levels of difficulty: Opening Round, Fair Game, and Challenge to test the knowledge of any practitioners, regardless of degree or experience.